Dhaka, Jun 17 (Just News): UN refugee agency special envoy Angelina Jolie visited Mosul in northern Iraq on Saturday and urged the international community not to forget residents trying to rebuild their city. Iraqi forces seized Mosul in July 2017 from Islamic State militants, who had occupied the city three years earlier and turned it into a stronghold of a “caliphate,” in a military campaign that saw 900,000 residents flee. 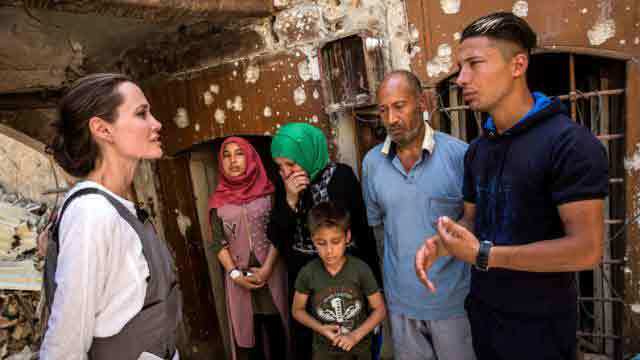 The Hollywood actress met families from western Mosul and walked through bombed out streets, according to video footage and photos provided by the UN High Commissioner for Refugees (UNHCR). But the old city in West Mosul was largely destroyed during a campaign by a 100,000-strong alliance of Iraqi government units, Kurdish Peshmerga fighters and Shi’ite militias backed by air support from a US-led coalition. UNHCR Special Envoy Angelina Jolie meets with Mohamed and his family during a visit to the Old City in West Mosul, Iraq on 16 June. Photo: Reuters“This is the worst devastation I have seen in all my years working with UNHCR. People here have lost everything,” Jolie said in a U.N. statement.